^ IUCN 2009. Nepenthes. In: IUCN Red List of Threatened Species. Version 2009.1. IUCN. ^ 2.0 2.1 2.2 2.3 2.4 McPherson, S.R. 2009. Pitcher Plants of the Old World. 2 volumes. Redfern Natural History Productions, Poole. ^ Author Query 页面存档备份，存于互联网档案馆. International Plant Names Index. ^ 7.0 7.1 McPherson, S.R. 2011. Discovery of an incompletely diagnosed pitcher plant from LuzoN. In: New Nepenthes: Volume One. Redfern Natural History Productions, Poole. pp. 457–459. ^ 9.00 9.01 9.02 9.03 9.04 9.05 9.06 9.07 9.08 9.09 9.10 9.11 Adam, J.H., C.C. Wilcock & M.D. Swaine 1992. The ecology and distribution of Bornean Nepenthes.PDF Journal of Tropical Forest Science 5(1): 13–25. ^ 11.0 11.1 11.2 11.3 （印尼文） Mansur, M. 2012. Keanekaragaman jenis tumbuhan pemakan serangga dan laju fotosintesisnya di Pulau Natuna. [Diversity on insectivorous plants and its photosynthetic rate in Natuna Island.] Berita Biologi 11(1): 33–42. Abstract 互联网档案馆的存檔，存档日期2013-09-21. ^ 12.0 12.1 12.2 12.3 12.4 Clarke, C.M. 2001. Appendix C: Distribution Maps. In: Nepenthes of Sumatra and Peninsular Malaysia. Natural History Publications (Borneo), Kota Kinabalu. pp. 299–307. ^ 13.0 13.1 13.2 13.3 （意大利文） Catalano, M. 2010. Nepenthes andamana M. Catal. sp. nov.PDF In: Nepenthes della Thailandia: Diario di viaggio. Prague. p. 34. ^ McPherson, S.R. 2010. Carnivorous Plants and their Habitats. 2 volumes. Redfern Natural History Productions, Poole. ^ 15.0 15.1 15.2 15.3 15.4 15.5 Lee, C.C., G. Bourke, W. Taylor, S.T. Yeo & K. Rembold 2011. Nepenthes appendiculata, a new pitcher plant from Sarawak. In: McPherson, S.R. New Nepenthes: Volume One. Redfern Natural History Productions, Poole. pp. 24–35. ^ 16.0 16.1 16.2 16.3 16.4 16.5 McPherson, S.R. & V.B. Amoroso 2011. Field Guide to the Pitcher Plants of the Philippines. Redfern Natural History Productions, Poole. ^ 18.0 18.1 18.2 18.3 18.4 Clarke, C.M. 2001. Nepenthes of Sumatra and Peninsular Malaysia. Natural History Publications (Borneo), Kota Kinabalu. ^ 20.00 20.01 20.02 20.03 20.04 20.05 20.06 20.07 20.08 20.09 20.10 20.11 20.12 20.13 20.14 20.15 von Arx, B., J. Schlauer & M. Groves 2001. CITES Carnivorous Plant Checklist.PDF The Cromwell Press, United Kingdom. ^ 21.0 21.1 21.2 McPherson, S.R. & A. Robinson 2012. Field Guide to the Pitcher Plants of Peninsular Malaysia and Indochina. Redfern Natural History Productions, Poole. ^ 23.0 23.1 23.2 23.3 23.4 23.5 23.6 23.7 23.8 23.9 Cheek, M.R. & M.H.P. Jebb 2001. Nepenthaceae. Flora Malesiana 15: 1–157. ^ 24.0 24.1 24.2 Clarke, C.M. 1997. Nepenthes of Borneo. Natural History Publications (Borneo), Kota Kinabalu. ^ 25.0 25.1 25.2 25.3 25.4 Gronemeyer, T., F. Coritico, M. Micheler, D. Marwinski, R. Acil & V. Amoroso 2011. Nepenthes ceciliae, a new pitcher plant species from Mount Kiamo, Mindanao. In: McPherson, S.R. New Nepenthes: Volume One. Redfern Natural History Productions, Poole. pp. 412–423. ^ 26.0 26.1 26.2 26.3 26.4 （意大利文） Catalano, M. 2010. Nepenthes chang M. Catal. sp. nov.PDF In: Nepenthes della Thailandia: Diario di viaggio. Prague. p. 38. ^ Co, L. & W. Suarez 2013. Nepenthaceae 页面存档备份，存于互联网档案馆. Co's Digital Flora of the Philippines. ^ Nooteboom, H.P. (ed.) 1987. Report of the 1982–1983 Bukit Raya Expedition. Rijksherbarium, Leiden. ^ 31.0 31.1 31.2 31.3 31.4 Robinson, A.S., J. Nerz & A. Wistuba 2011. Nepenthes epiphytica, a new pitcher plant from East KalimantaN. In: McPherson, S.R. New Nepenthes: Volume One. Redfern Natural History Productions, Poole. pp. 36–51. ^ 33.0 33.1 33.2 33.3 33.4 33.5 Phillipps, A., A. Lamb & C.C. Lee 2008. Pitcher Plants of Borneo. Second EditioN. Natural History Publications (Borneo), Kota Kinabalu. ^ 34.00 34.01 34.02 34.03 34.04 34.05 34.06 34.07 34.08 34.09 34.10 34.11 McPherson, S., J. Cervancia, C. Lee, M. Jaunzems, A. Fleischmann, F. Mey, E. Gironella & A. Robinson 2010. Nepenthes gantungensis (Nepenthaceae), a new pitcher plant species from mount Gantung, Palawan, Philippines. In: S.R. McPherson Carnivorous Plants and their Habitats. Volume 2. Redfern Natural History Productions, Poole. ^ （印尼文） Hidayat, S., J. Hidayat, Hamzah, E. Suhandi, Tatang & Ajidin 2003. Analisis vegetasi dua jenis tumbuhan pemakan serangga di Padang Pinang Anyang, Pulau Belitung. 页面存档备份，存于互联网档案馆 [Vegetation analysis of two insectivorous plants in Padang Pinang Anyang, Belitung Island.] Biodiversitas 4(2): 93–96. ^ 36.0 36.1 Burbidge, F.W. 1882. Notes on the new Nepenthes. 页面存档备份，存于互联网档案馆 The Gardeners' Chronicle, new series, 17(420): 56. ^ 38.0 38.1 38.2 38.3 38.4 38.5 Gronemeyer, T., A. Wistuba, V. Heinrich, S. McPherson, F. Mey & A. Amoroso 2010. Nepenthes hamiguitanensis (Nepenthaceae), a new pitcher plant species from mindanao Island, Philippines. In: S.R. McPherson Carnivorous Plants and their Habitats. Volume 2. Redfern Natural History Productions, Poole. pp. 1296–1305. ^ 42.0 42.1 Mansur, M. & F.Q. Brearley 2008. Ecological studies on Nepenthes at Barito Ulu, Central Kalimantan, Indonesia Archive.is的存檔，存档日期2012-07-08. Jurnal Teknologi Lingkungan 9(3): 271–276. ^ 43.0 43.1 43.2 43.3 43.4 43.5 Mey, F.S., M. Catalano, C. Clarke, A. Robinson, A. Fleischmann & S. McPherson 2010. Nepenthes holdenii (Nepenthaceae), a new species of pyrophytic pitcher plant from the Cardamom mountains of Cambodia.PDF In: S.R. McPherson Carnivorous Plants and their Habitats. Volume 2. Redfern Natural History Productions, Poole. pp. 1306–1331. ^ 44.0 44.1 44.2 44.3 Hernawati & P. Akhriadi 2006. A Field Guide to the Nepenthes of Sumatra. PILI-NGO Movement, Bogor. ^ 45.0 45.1 45.2 （意大利文） Catalano, M. 2010. Nepenthes kerrii M. Catal. et T. Kruetr. sp. nov.PDF In: Nepenthes della Thailandia: Diario di viaggio. Prague. p. 32. ^ 46.0 46.1 46.2 46.3 McPherson, S.R. 2011. New Nepenthes: Volume One. Redfern Natural History Productions, Poole. ^ 47.0 47.1 McPherson, S.R. & A. Robinson 2012. Field Guide to the Pitcher Plants of Australia and New Guinea. Redfern Natural History Productions, Poole. ^ 48.0 48.1 Schlauer, J. N.d. Nepenthes kongkandana 页面存档备份，存于互联网档案馆. Carnivorous Plant Database. ^ 49.0 49.1 49.2 49.3 49.4 49.5 Robinson, A., J. Nerz, A. Wistuba, M. Mansur & S. McPherson 2011. Nepenthes lamii Jebb & Cheek, an emended description resulting from the separation of a two-species complex, and the introduction of Nepenthes monticola, a new species of highland pitcher plant from New Guinea. In: McPherson, S.R. New Nepenthes: Volume One. Redfern Natural History Productions, Poole. pp. 522–555. ^ 50.0 50.1 50.2 50.3 50.4 50.5 McPherson, S., G. Bourke, J. Cervancia, M. Jaunzems, E. Gironella, A. Robinson & A. Fleischmann 2011. Nepenthes leonardoi (Nepenthaceae), a new pitcher plant species from Palawan, Philippines. Carniflora Australis 8(1): 4–19. ^ Bourke, G. 2007. Exploring the upper reaches of Gunung Trus Madi. Carniflora Australis (9): 9–16. ^ 54.0 54.1 （印尼文） Sunarti, S., A. Hidayat & Rugayah 2008. Keanekaragaman tumbuhan di hutan Pegunungan Waworete, Kecamatan Wawonii Timur, Pulau Wawonii, Sulawesi Tenggara. 页面存档备份，存于互联网档案馆 [Plants diversity at the mountain forest of Waworete, East Wawonii District, Wawonii Island, Southeast Sulawesi.] Biodiversitas 9(3): 194–198. ^ Nepenthes maxima. IUCN Red List of Threatened Species 2006. International Union for Conservation of Nature. 2000. ^ Robinson, A. 2012. Nepenthes merrilliana on Samar. Carnivorous Plants in the tropics, June 29, 2012. ^ 57.0 57.1 Schlauer, J. N.d. Nepenthes mirabilis 页面存档备份，存于互联网档案馆. Carnivorous Plant Database. ^ Nepenthes mirabilis 页面存档备份，存于互联网档案馆. Flora of China. ^ 59.0 59.1 59.2 59.3 59.4 Nerz, J., A. Wistuba, C.C. Lee, G. Bourke, U. Zimmermann & S. McPherson 2011. Nepenthes nigra, a new pitcher plant from Central Sulawesi. In: McPherson, S.R. New Nepenthes: Volume One. Redfern Natural History Productions, Poole. pp. 468–491. ^ McPherson, S.R. 2011. Observations of Nepenthes philippinensis and related taxa. In: New Nepenthes: Volume One. Redfern Natural History Productions, Poole. pp. 382–395. ^ 61.0 61.1 Lee, C.C., S. McPherson, G. Bourke & M. Mansur 2009. Nepenthes pitopangii (Nepenthaceae), a new species from central Sulawesi, Indonesia. The Gardens' Bulletin Singapore 61(1): 95–100. ^ 62.0 62.1 62.2 62.3 62.4 Gronemeyer, T., S. McPherson, F. Coritico, M. Micheler, D. Marwinski & V. Amoroso 2011. Nepenthes pulchra, a new pitcher plant species from Mount Kiamo, Mindanao. In: McPherson, S.R. New Nepenthes: Volume One. Redfern Natural History Productions, Poole. pp. 424–439. ^ Clarke, C.M. & R. Kruger 2005. Nepenthes rowanae (Nepenthaceae), a remarkable species from Cape York, Australia 页面存档备份，存于互联网档案馆. Carnivorous Plant Newsletter 34(2): 36–41. ^ Nerz, J., P. Mann, T. Alt & T. Smith 1998. Nepenthes sibuyanensis, a new Nepenthes from Sibuyan, a remote island of the Philippines 页面存档备份，存于互联网档案馆. Carnivorous Plant Newsletter 27(1): 18–23. ^ 69.0 69.1 Mey, F.S. 2010. 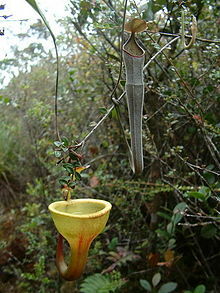 Introduction to the pitcher plants (Nepenthes) of Cambodia.PDF Cambodian Journal of Natural History 2010(2): 106–117. ^ 70.0 70.1 （意大利文） Catalano, M. 2010. Nepenthes della Thailandia: Diario di viaggio. Prague. ^ 71.0 71.1 71.2 71.3 （意大利文） Catalano, M. 2010. Nepenthes suratensis M. Catal. sp. nov.PDF In: Nepenthes della Thailandia: Diario di viaggio. Prague. p. 36. ^ Elmer, A.D.E. 1915. Nepenthaceae. [pp. 2785–2787] In: Two hundred twenty six new species—II 页面存档备份，存于互联网档案馆. Leaflets of Philippine Botany 8: 2719–2883. ^ Mey, F.S., L.H. Truong, D.V. Dai & A.S. Robinson 2011. Nepenthes thorelii, an emended description and novel ecological data resulting from its rediscovery in Tay Ninh, Vietnam. In: McPherson, S.R. New Nepenthes: Volume One. Redfern Natural History Productions, Poole. pp. 104–131. ^ 76.0 76.1 76.2 76.3 76.4 76.5 Lee, C.C., A. Wistuba, J. Nerz, U. Zimmermann, A.P. Paserang & R. Pitopang 2011. Nepenthes undulatifolia, a new pitcher plant from South East Sulawesi. In: McPherson, S.R. New Nepenthes: Volume One. Redfern Natural History Productions, Poole. pp. 492–505. ^ 77.0 77.1 77.2 77.3 （德文） Micheler, M., T. Gronemeyer, A. Wistuba, D. Marwinski, W. Suarez & V. Amoroso 2013. Nepenthes viridis, eine neue Nepenthes-Art von der Insel Dinagat, Philippinen. Das Taublatt 76: 4–21. ^ 78.0 78.1 78.2 McPherson, S.R. 2011. The discovery of Nepenthes sp. 'Anipahan'. In: New Nepenthes: Volume One. Redfern Natural History Productions, Poole. pp. 330–345. ^ Jebb, M. 1994. NEPENTHES revision for Flora Malesiana 页面存档备份，存于互联网档案馆. Carnivorous Plant Mailing List, September 9, 1994. ^ 81.0 81.1 Krutzsch, W. 1985. Über Nepenthes-Pollen im europäischen Tertiär. Gleditschia 13: 89–93. ^ Anderson, J.A.R. & J. Muller 1975. Palynological study of a Holocene peat and a Miocene coal deposit from NW Borneo. Review of Palaeobotany and Palynology 19(4): 291–351. ^ Kumar, M. 1995. Pollen tetrads from Palaeocene sediments of Meghalaya, India: comments on their morphology, botanical affinity and geological records. Palaeobotanist 43(1): 68–81. ^ Saxena, R.K. & G.K. Trivedi 2006. A Catalogue of Tertiary Spores and Pollen from India.PDF Birbal Sahni Institute of Palaeobotany, Lucknow.